The oldest cosmological paradox considers the fact that the night sky should not appear dark in an infinite, ageless Universe. It should glow with the brightness of a stellar surface, because, if we look far enough, we would see some star. The Universe has only a finite number of stars. The distribution of stars is not uniform. So, for example, there could be an infinity of stars, but they hide behind one another so that only a finite angular area is subtended by them. The Universe is expanding, so distant stars are red-shifted into obscurity. The Universe is young. Distant light hasn’t even reached us yet. Galaxies Galore! 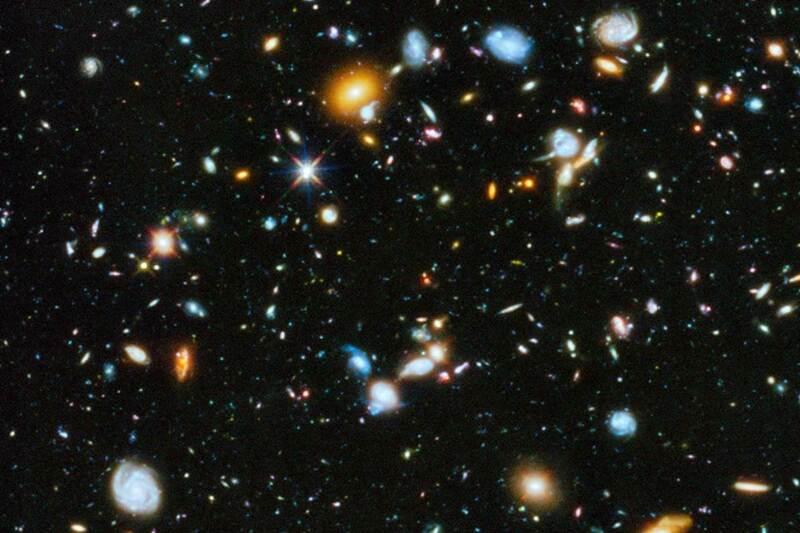 Hubble Ultra Deep Field 2014. Other Hubble Pictures Within our own Milky Way giant galaxy, show nearly solid wall of stars, that is, the Olber’s effect! The premise of the second explanation may technically be correct. But that means that the universe is finite. The third explanation may be partially correct, because matter is very far from being uniformly distributed in the universe. We just don’t know how severe the lumping is: there are Great Walls (of galaxies! 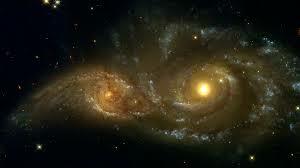 ), Great Attractors (of galaxies! ), Great Blobs (of quasars! ), etc. If the stars are distributed in a lumpy way, then there could be large patches of empty space (which there is, because they have been seen! ), so the sky could appear dark except in those directions. The final two possibilities are presently viewed as correct by common cosmologists, and a cause of what’s observed. Some computational arguments suggest that the finite age of the Universe is the larger effect. We live inside a spherical shell of “Observable Universe” which has a diameter equal to the (“Cartan’s comoving”) distance covered by the expanding universe during the lifetime of said Universe. That’s 95 billion light-years, according to the most esteemed conventional computation. Objects which were far enough to start with, are too far away for their light ever to reach us. How does my own SubQuantum Patrice Reality (SQPR) theory fits in all this? Very well. In my theory, the universe also expands (that’s called “Dark Energy”, and it’s a direct experimental fact). But the universe expands slowly (that’s how I resolve the problems “cosmological inflation” is supposed to resolve, but doesn’t!). As the universe slowly expands, every single photon wave gets stretched, as in the usual Big Bang Lemaitre metric. However now that effect is not enough to solve Olbers paradox (the expansion being too slow). So another effect comes into play: light ages, from the Sub Quantum Reality (SQPR). The average photon coming from far away is so spread-out, when it hits an object, somewhere, that part of said photon is too far to coalesce with the rest, thus gets disconnected from the main singularization, and is left, in the average, as a 3 Kelvin remnant. 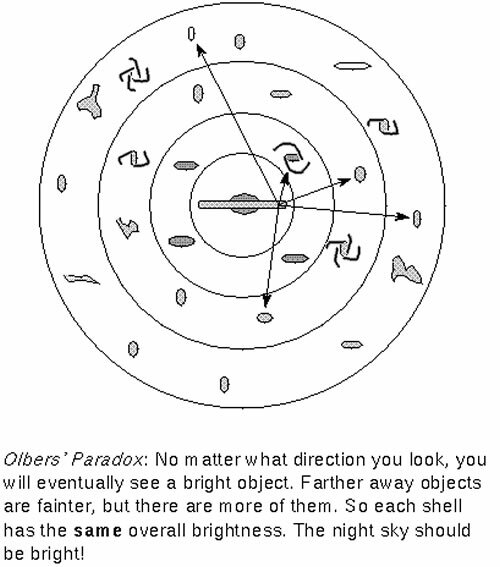 Notice that Olbers and his predecessors could have deduced much from the simple fact that the sky was not all like the surface of the sun. Olbers said: that’s because there is dust. But ultimately dust would turn as yellow and hot as the sun too. It didn’t, either because the density of stars was not constant… Or then the universe was only 6,000 years old, or so (;-)). This being said, dust should not be ignored. Recently, it was proclaimed a proof of cosmological inflation had been found, and eminent cosmologists such as inflationistas like Guth were already attributing to themselves the Nobel Prize, but it was only an effect due to galactic dust. Sorry for those who cling to the notion of “Politically Correct” like rats do, with a sinking ship. This title is probably rather discombobulating for them. I will justify it thereafter. Yes, it can be smart to ignore much. Yes, it can be cruel and vicious to be naïve. Yes, it can be enlightened, to hate. Yet, what does the Dark Side thinks of the text “Vous n’aurez pas ma haine/You will not have my hatred”? Does it smirk? Or does it approve of the text, totally? Surely, the latter. The technique advised by Leiris, a selective shut down of one’s mental, not to say neurological, system, is a basic functionality the Dark Side needs to operate, selective attention. There are indeed, neurological reasons for it. Leiris’ text explores, advocates and celebrates, a crucial, actually life saving, strategy. It is a neurophilosophical approach. That is a neurological approach endorsed by the most sophisticated philosophy, as I will explain presently. One can go much beyond what La Rochefoucauld smartly observed, more than three centuries ago. All & Any Human Behavior Can, & Should, Be Used In All The Many Ways Circumstances May Require, For The Greater Good, Of The Greatest Sentience. The key observation is that one can be of many minds, on many things. More exactly, the brain can, and has to, use different Modi Operandi, according to circumstances. Is the preceding too ethereal, theoretical, vaporous, nothing to do with day-to-day reality? President Bush, the invader of Iraq, removed 28 pages of the official report on the 9/11 attack. Why? CIA Director John Brennan appeared on NBC’s “Meet the Press”, on May 1, 2016, arguing that the 28 pages should not be released because the American people are incapable of evaluating them. Americans are incapables. Brennan explained: “I think some people may seize upon that uncorroborated, unvetted information that was in there that was basically just a collation of this information that came out of FBI files, and to point to Saudi involvement, which I think would be very, very inaccurate.” High caste Saudis, of course had nothing to do with 9/11, as demonstrated by the fact that Bush ran several flights to allow them to flee the USA when no plane was allowed to fly, inside, or out of the US. Brennan in his stupidity, let it slip by denying it: it is known Saudi “civil servants” seem to have help the Islamists of 9/11. That would be no surprise: the SIA and CIA activated Bin Laden, and launched him as a terrorist. Not only naivety has a Dark Side, but it can be imposed on We The People. When one fights for survival, nothing should matter to the brain, but for activity conducive to said survival. Neurological concentration on the situation can become close to 100%. What happens in ultra emergency? Time stretches, while the brain mobilizes well beyond 100% (namely neurons, including motor neurons obviously work beyond their normal maximum. Thus superhuman strength and reflexes). The brain is fully in survival mode, and has no thought considered, only strategy implemented. Even sensations not useful for survival are not felt, especially pain. This is what Mr. Leiris advocates, on the mental level. He excludes from his mind all what is not conducive to provide his son with what the baby needs, a maximally loving environment, even in harrowing circumstances. .
Had I been exactly in Antoine Leiris’ circumstances, I would have actually embraced the same mental strategy. I know, because I have already been in similar circumstances, where my mind had to concentrate absolutely: I was caught in avalanches twice, and saved my life through action which was nothing short of incredible, and resulted from extreme mental concentration. Once, an improvised Explosive Device was thrown on me by some fascists and exploded on a gentleman just in front, who acted as an unwitting human shield. from terrorism. Why? Because at this point the brain has become god, master of life and death. Its mission is only about survival, whether insuring that of the brain, or the termination of the survival of the adversary. How does the brain focus on survival? It decides what the universe is. And it operates with an extremely simplified version of the universe, and not just of the universe of consideration. The brain also admits only a simplified version of the universe of sensation. The universe of sensations which matters for survival. The rest plain does not exist, because it is outright not perceived. Naivety can be very useful. But naivety can also kill, has killed, and nearly got me a few times. Naivety is what enables much nefariousness to produce evil industrially. Reconsider Mr. Brennan, the CIA chief, above: why is he allowed to think We The People are a bunch of unteachable idiots, hopelessly infantile, a danger to ourselves, while keeping his job? In “You will not have my hatred“, Mr. Leiris says that, sometimes, hatred is better left out of it. Is that a new idea? No. The idea is actually central to Christiano-Islamism. Ironically, the Qur’an reminds us every few lines that “Allah is merciful” (however, it’s not clear we should be merciful too). That obsession, that Allah forgives all day long, was directly inherited from Christianism… Where, indeed, the faithful has to be merciful. As there is much I dislike in Islamism and Christianism, does this mean I dislike all their concepts? Far from it. I actually love a beautiful mosque or church. And I love mercifulness. Not just because it’s pretty, but also because it’s necessary. I think mercifulness is totally fundamental. Mercifulness is not just wise: it’s a fundamental part of the behavior of any social animal. It’s a code to correct errors. A small human group could not function without an error correcting code. The name of that code is mercifulness. But does that mean that hatred unworthy always? No. Far from it. And what does “hatred” consists of, anyway? Let’s suppose something that has happened before, on more than one continent: Patrice is out there, trying to terminate a cockroach infestation. Cockroaches are smart, fast and flat: they can squeeze in the smallest crack in the blink of an eye. So here I am, trying to kill lots of cockroaches, in all sizes from one millimeter to several centimeters. Am I animated by hatred? No. I am just concentrated on all the possibilities, the thinnest cracks. So, to commit mass murder, hatred is not necessary. So what does hatred consist of? When is it called for? Why is it so bad? Well, the answers are rather surprising. Hatred is called for, when it is needed. Hatred does not happen by accident. Hatred is, often a supplement of passion needed for an otherwise unsavory task. Faced with something objectively really bad, hatred is not called for. No need for hatred to eliminate mosquitoes. Hatred is needed when other passions are in the way, and these passions prevent the accomplishment of what is viewed, deep down, as a necessary task. For example, when common sense and decency are in the way. But not only. It could be love which is preventing the accomplishment of a needed task. For example, the Nazis needed hatred to launch the Second World War. They needed the hatred to overwhelm decency, basic common sense, and whatever humanity they still harbored. However, as the war went on, the attitude of the top Nazis, say towards the French, changed. The Nazis did not need hatred anymore: the war was long launched, and was not going well. However, hatred was now in the way of many behaviors the Nazis needed to see deployed such as decency, mercifulness, common sense, humanity… and the more so, the more the war was turning against them. Well before the end, the top Nazis started to disobey Hitler’s orders. In the end, even Himmler negotiated with the Swedes to save… Jews (they saved thousands!). It’s not just that Himmler was trying to save his precious skin from the cyanide pill in his mouth. It’s also that hatred was not needed anymore. Hatred against the Islamist Pseudo State is obviously not needed. There is no love, decency, or common sense in the way, which we need to overcome, to accomplish the task at hand. Eradication will be plenty enough. Finally, the president should tell the CIA that it is naïve, haughty and cruel, to consider the American People too naïve, ignorant and malevolent, for the truth, while hoping that they are going to live with that contempt and the trampling of their right to know, much longer. Some people go around, and brandish the “Multiverse”. Of course, the “Multiverse” exists, in one’s brain. The brain, among other things, extends all over imagination. Out there, among the galaxies, in the real world, there is no reason to suppose there is a “Multiverse, whatsoever. The Universe is all there is. By definition. By philosophical definition. Just by philosophical definition? Not so. Any logic is associated to a universe. If the “logic” is nature itself (“all of the logic”) the associated universe (in the Logic sense), is, well, the Universe. If something some would want to call the “Multiverse”, whatever that would be, existed, it would be part of the Universe. Age Of The Universe? Really? Befuddled physicists go around, telling us about the “First Three Minutes” (Weinberg; Electro-Weak Nobel laureate), or the “History Of Time” (Hawking; remarkable survivor-physicist in a wheelchair). That rests on their perfect knowledge of how the universe evolved. This, in turn, depends upon ignoring Dark Energy. Dark Energy shows up as an unpredicted acceleration of the expansion of the Universe. The old theory of expansion of the Universe was established before Dark Energy was discovered. So they think they know, but I know they don’t really know. I don’t know if the Universe has an age. But it is aging, or, at least, let’s be more cautious, the Universe is changing. Mathematics themselves have always been developed in particular directions, in light of what it was felt was needed to understand the physical world. That was certainly true with Buridan, and his students, who developed computational methods, and graphs, to handle what they wanted to do with inertia. That was true with calculus developed for all sorts of engineering and physics explanations. And so on through the next three centuries. However, in the last three decades, what I personally viewed as extremely erroneous notions in physics became dominant. Indeed, it had become that clear time was not “relative” (whatever that is supposed to mean). True, time was local, as per Relativity, but it was local in an absolute way. The absoluteness comes from Quantum Theory… And the absoluteness of curvature in cosmology (the focusing of light, by galaxies and galactic clusters is absolute, thus so is time, locally around such focusing objects!). Efforts were launched towards was felt would be the mathematics of “superstrings” and “field theory”. That would have been wonderful, if the initial meta-axiom motivating the whole enterprise, that nature worked with strings, super, and field mathematics perched on field math, all the way down… had been, roughly, correct. Mathematics is not “natural”. Or let’s say, not anymore “natural” than the human brain can get contrived. Mathematics is an adventure in what the geometry, the Quantum geometry, of neurology is capable of. Mathematics is not unreasonably effective (as the famous physicist-mathematician Wigner put it). Mathematics is reason, manipulated to be effective in a particular way. Correctly determining in advance what the way will be makes the difference between understanding nature, and failing to do so. Math is just, roughly, neuronal geometry that “works” (“working” here meaning what the brain does, whatever it is, beyond just manipulating electric and chemical signals). Do We Need To Tour Frantically With Jets? In other news, after the crash in France of a Lufthansa A320 plane, pundits will surely come, and claim aloud that air travel is the safest mode of travel. Is it? It depends upon the method of measurement. The way advertisers come up with the “air travel is the safest form of travel” statement is by dividing number of people killed by distance travelled. However, another measure would be to divide the number of people killed by the number of travels they engaged in. This is a more significant measure to think about. And air travel looks much good that way: in just one day in Europe, more car travels happen than all the air travel for the entire world, in a year. Not to say that air travel should be discouraged. It is not exactly like smoking, with no redeeming value, whatsoever. Families ought to be reunited. Getting to know other countries, encouraged. However one week tourism, far away, thanks to plane travel ought, in my opinion, to be discouraged. Instead, the projections are that air travel will augment considerably in the next few decades. Between Barcelona and Dusseldorf, one ought to be able to travel just as fast by rail (not all the high speed lines are built, nor will they be built, thanks to plutocratically imposed austerity, and subsidies to… air travel). Electric trains pollute much less, by more than an order of magnitude, and are much safer. The global CO2 situation is that bad. Besides, look at that entire high school classroom of fifteen year old that went down with the plane… Just for a week in Barcelona?